New Delhi, July 29 (IANS) A day after the Kerala High Court directed the Athletics Federation of India (AFI) to include Asian Athletics gold medallist runner P.U. Chitra in the team for next months IAAF World Championships in London, Union Sports Minister Vijay Goel on Saturday directed the AFI to ensure her participation. 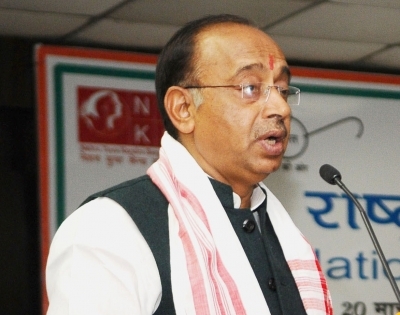 “Sports Minister Vijay Goel has advised the Atheletic Federation of India (AFI) to honour the Kerala High Court directive to ensure the participation of P.U. Chitra in 1,500 metres race in the IAAF World Championships to be held in London from August 4,” the Sports Ministry said in a statement. “Goel talked to AFI President Adille Sumariwalla on the issue and advised him not to contest the directive given by the Kerala High Court as P.U. Chitra is otherwise a wild card entry for the World Championship,” it added. The Kerala runner won the 1,500m gold at the Asian Championships in Bhubaneswar earlier this month, clocking a personal best of 4:17.92. Chitra was second in the inter-state meet clocking around 4:28. The entry standard for the August 4-13 London meet is 4:07. The AFI had earlier argued Chitra was omitted from the 24-member team because she failed to meet the qualifying mark set by the International Association of Athletics Federations (IAAF). But she contended her Asian meet victory made her an automatic pick for London.